bbq Totoro: "We had a very real reason to try our hardest"
Congratulations on breaking the losing streak. How do you feel about today's match? I lost confidence in laning bot as our losing streak continued, but our toplaner, midlaner and jungler all helped us out so that we could pick ourselves up. We were only able to come back after losing Game 1 because we stayed positive while maintaining good team mood. You've done well with Brand in Game 2. Was it a planned pick to counter Lulu? 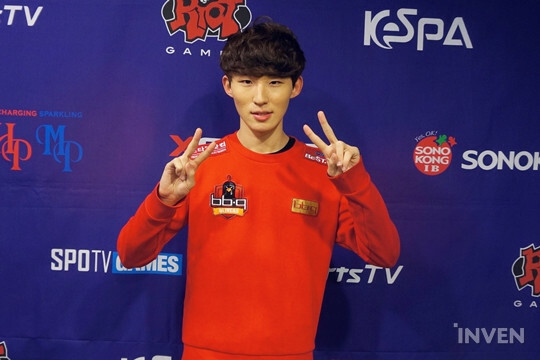 Brand was something that we've prepared as a counter pick against Lulu. Lulu might have the initiative in the early laning phase, but Brand will be able to seize the initiative with his passive ability after Level 3. We also could count on Shen to help us out, so we were able to be aggressive in laning. Even in teamfights, Brand can withstand being focused down. Lulu became more popular recently as a high tier support, but you chose to pick something else instead. Can you tell us why? Since we were prepared to play against Lulu, we didn't feel that we had to pick her. Besides, I'd prefer not to play Lulu in the first place as I'd rather play tankier champions with more crowd control abilities. In Game 3, SSol's Lucian was a significant threat throughout the game. Were you afraid that you might lose the match because of him? That game showed how strong Lucian is in this patch. However, it was easier for us to take control of objectives due to stacked Mountain Drake buffs. Since their Maokai had to dive into us in order to win a teamfight, we tried to keep Maokai away from us as much as possible, and we managed to win as we all managed to avoid being focused down too much. You've been through a long losing streak. What feedback have you shared with each other in order to break the losing streak? We talked about how we tilt easily and lose focus over time. It was more apparent when we went to Game 3. As we felt more anxious and our teamwork started to fall apart, our losing streak continued on. However, now that we were facing the possibility of being relegated to the promotion match, we had a very real reason to try our hardest - That's why we've won today. Thank you for your time. Do you have anything else that you want to share? As our losing streak continued, we started to talk less and play even worse. Now that we ended our losing streak, we'll make sure that we can end the season on a high note. Also, I would like to thank our sponsors - Maxtill, GGtics, Sta1.com, Club-pass and Genesis bbq.